Preheat oven to 325 degrees F (160 C). Grease and flour 10-inch tube pan. Mix together the flour and baking powder. Cream together butter, shortening and sugar until light and fluffy. Beat in the eggs one at a time. Beat in the flour mixture alternately with the milk, mixing just until incorporated. Stir in key lime juice and vanilla extract. Pour batter into prepared pan. Bake in a preheated oven for 90 minutes or until a toothpick inserted into the center of the cake comes out clean. Allow to cool in pan 10 minutes. Turn it out onto wire rack. While warm, prick top of cake with toothpick. Pour Key Lime Glaze (see below) over warm cake. Cool completely. In small saucepan, combine sugar, butter and key lime juice. Bring to boil. Continue to boil, stirring constantly, for 1 minute. Remove from heat. This is a great recipe. You MUST add eggs one by one, mixing very well in between ... I substituted milk for buttermilk and did all butter - no shortening... also, freshly squeezed key limes and 1/4 cup of extra flour with an extra 1/4 spoon of baking powder. It is very important to beat the batter before adding the flour! I sifted the flour before adding it to the recipe. Added eggs one at a time and the recipe turned out superb. 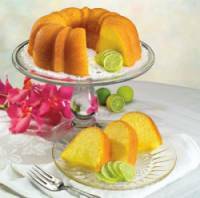 This cake is great, made it several times and shared the recipe with family.